With the Body-Solid Synchronized-Recumbent Ab Bench GAB350 you can perform the most effective crunches possible no matter what your level of fitness! The new Semi Recumbent Synchronized Dual Ab Crunch Bench works your abs to perfection by allowing you to increase or decrease resistance with weight plates. Having trouble finishing a set of crunches using your own weight as resistance? Simply add weight to the plate holder to the rear of the machine for assistance. Crunches are as comfortable as they are effective with extra thick and durable Durafirm seat pads. The days of dreading crunches and sit–ups on a cold hard unforgiving floor are over. 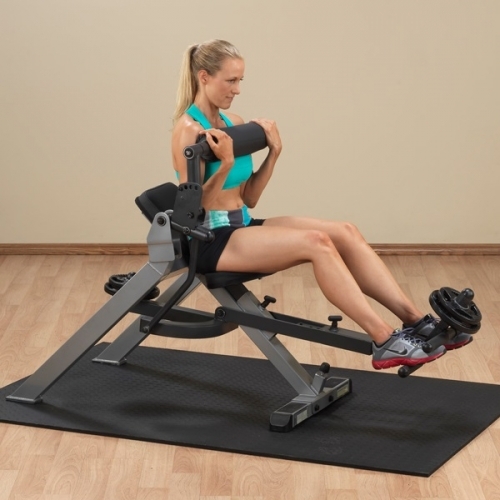 Make ab work more effective, comfortable and exciting with the new Body-Solid Synchronized-Recumbent Ab Bench GAB350. The Body-Solid Synchronized-Recumbent Ab Bench GAB350 is designed to provide an intense workout while eliminating strain, the Body-Solid Synchronized-Recumbent Ab Bench GAB350 is hard to beat. Easy and convenient step-in design makes getting started a breeze. The Body-Solid Synchronized-Recumbent Ab Bench GAB350 thick, comfortable DuraFirm™ pads reduce fatigue and discomfort allowing you keep working out. Rock solid support and stability is delivered via heavy-gauge steel frames with all-4-side welded construction. The Body-Solid Synchronized-Recumbent Ab Bench GAB350features are thick, comfortable DuraFirm pads that reduce fatigue and discomfort allowing you keep working out. Rock solid support and stability is delivered via heavy-gauge steel frames with all-4-side welded construction. The Ab crunch is one of the best ways to work your abs in a safe and efficient manner. Call 1-800-875-9145 with any questions you may have about the Body-Solid Synchronized-Recumbent Ab Bench GAB350. 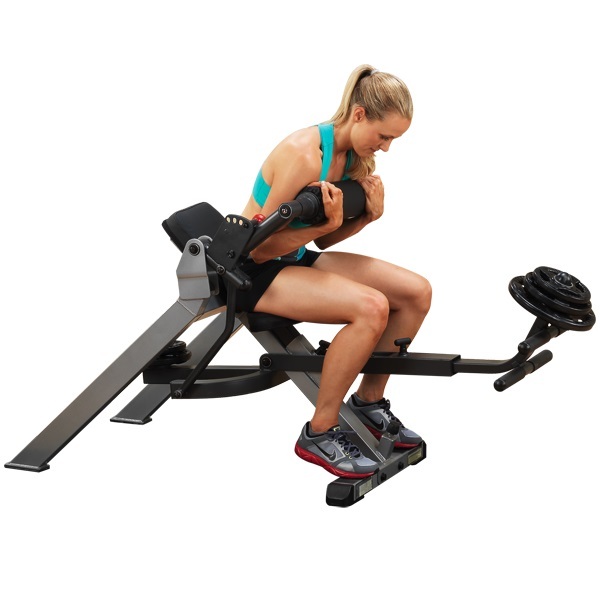 Order your your Body-Solid Synchronized-Recumbent Ab Bench GAB350 from FitnessZone.com today! The Body-Solid Synchronized-Recumbent AB Bench performs the most effective crunches possible no matter what your level of fitness! The new Semi Recumbent Synchronized Dual Ab Crunch Bench works your abs to perfection by allowing you to increase or decrease resistance with weight plates. Having trouble finishing a set of crunches using your own weight as resistance? Simply add weight to the plate holder to the rear of the machine for assistance. To increase resistance - add weights to the plate holder near feet. Used with Olympic Weight Plates Only. The Body-Solid Synchronized-Recumbent Ab Bench GAB350 perform the most effective crunches possible no matter what your level of fitness! The new Body-Solid Synchronized-Recumbent Ab Bench GAB350 works your abs to perfection by allowing you to increase or decrease resistance with weight plates. Having trouble finishing a set of crunches using your own weight as resistance? Simply add weight to the plate holder to the rear of the machine for assistance. Crunches are as comfortable as they are effective with extra thick and durable Durafirm seat pads. The days of dreading crunches and sit –ups on a cold, hard, unforgiving floor are over. Make ab work more effective, comfortable and exciting with the new Crunch Bench by Body Solid. Backed for a LIFETIME of use by the best warranty in the industry. 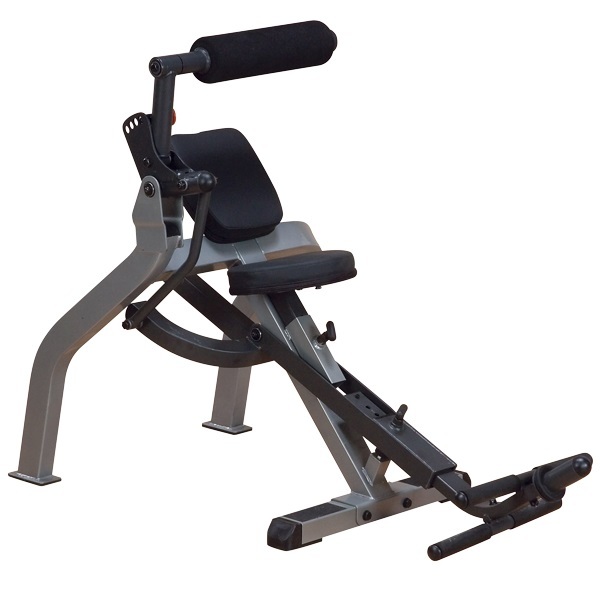 Order your Body-Solid Synchronized-Recumbent AB Bench from FitnessZone.com today!